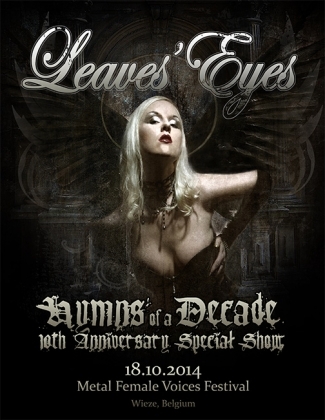 Leaves Eyes have confirmed they will be doing a special show for this years MFVF, to celebrate their 10th anniversary. Entitled "Hymns of a decade", fans will be able to vote for the songs they want to hear live (keep checking the Leaves Eyes facebook page for details). In this day and age female fronted metal bands are normal part of everyday life. They are so common, in fact, that it's a waste of breath making the distinction between them and bands with a hairy, ugly guy behind the microphone. There was a time, however, when the idea of a woman fronting a full-on metal band was dismissed by metal fans and press alike as absurd. The world accepted Doro Pesch fronting Warlock and Sabina Classen leading Holy Moses in the '80s, sure, but it wasn't until the rise of The 3rd And The Mortal, The Gathering and Theatre Of Tragedy in the early '90s that the movement towards equality in metal truly began. Now, in celebration of a revolution that launched an entirely new musical genre, vocalists Kari Rueslåtten (The 3rd And The Mortal), Anneke van Giersbergen (The Gathering) and Liv Kristine Espenaes Krull (Leaves' Eyes, Theatre Of Tragedy) have united for a journey into the past presented live on stage: The Sirens. The seeds for The Sirens were planted when Anneke approached Kari in early 2013 with the proposal of doing a duet for her Drive album (released in 2013). Regarded by Anneke as an inspiration going in to do The Gathering's breakthrough album, Mandylion, her intention was to pay tribute to Kari via the collaboration. The song didn't make the final cut as it didn't fit the album, but they remained in touch. Then, in July 2013 Anneke and Liv had a chance meeting at the Masters Of Rock festival in the Czech Republic, and The Sirens concept was born. "We had a few minutes only to talk in between our gigs," Liv recalls, "but we agreed that we really should get together and tour. We both had to smile then, thinking that we were, with Kari, the 'originals' within our scene. Moreover, all three of us being mothers and still highly busy in music and art. Anneke told me that she had just talked to Kari, and that was the 'go' for The Sirens"
"I find it hard to believe that I once inspired them," Kari admits, "but if so it is truly flattering. It is a fantastic feeling to know that I will be singing live with two such amazing vocalists!" The Sirens tour will be split into two parts, including festival appearances, and staged at the end of 2014 in October and December. It will be a full concert showcasing the trio, one band, and a setlist featuring songs from The 3rd And The Mortal, The Gathering and Theatre Of Tragedy as well as tracks from Kari, Anneke and Liv's respective solo careers. They will sing alone, perform duets, capping off the night with all three of them on stage, with a show that is expected to clock in at around 100 minutes each night. Thus, it's a trip down memory lane produced for the here and now with brand new and unexpected elements, making The Sirens a nostalgia-fuelled reminder of who started it all and why it worked. And at the end of the night nobody will leave disappointed. "The female fronted scene has become so big all over the world, sometimes it's hard to believe the three of us were at the very beginning of it," says Anneke. "I am very proud of that. Without intentionally wanting to start a new genre, our bands made it okay to sound and look as a girl singer on a metal stage. It was all very new and exciting. I think the tour is great to, in a way, celebrate those early days now that a third-wave of bands is appearing on the scene." There are noteworthy parallels in the lives of Kari, Anneke and Liv that bind them together. All three fronted influential bands, they went on to have lucrative solo careers and remain active, and they've successfully balanced music with family life. It's clear the trio share a chemistry that will make The Sirens a rousing success. "I'm looking forward to it a lot," Anneke says. "Making music with kindred spirits is such a wonderful feeling. I also love harmonizing with more than one singer on stage, so that will be a cool aspect of the show as well." "The fans have been waiting for this for years and years," Liv adds. "I can't wait to share stage with Kari and Anneke. They are absolutely lovely and we have so much in common. This is a kind of magic." Anneke van Giersbergen proved her credentials and immense vocal talent for 13 years as frontwoman of The Gathering. Their first joint effort Mandylion was considered a groundbreaking achievement upon its release in 1995. In 2007 Anneke felt it was time to begin her own solo career. The charismatic singer quickly established herself as a solo artist. In 2012 she was nominated for two Edison awards, Holland's most prestigious music prize, for her album Everything Is Changing. The album took Anneke all over the world as she toured over 25 different countries. In recent years Van Giersbergen also found time to collaborate with some of her long-time friends and musical peers, lending her powerful voice to the likes of Anathema (Falling Deeper), the eccentric Devin Townsend (Addicted!, Epicloud, The Retinal Circus) and fellow Dutchmen Within Temptation (Black Symphony). Her fifth studio album, Drive, was released worldwide by Inside Out Music in September 2013. Liv Kristine Espenaes Krull began her career in 1994 in her home town of Stavanger, Norway as soprano vocalist and founding member of Theatre Of Tragedy. Their self-titled debut, released in 1995, made waves across the metal scene due to the combined female soprano vocals and death metal growls. Theatre Of Tragedy's breakthrough came the following year with Velvet Darkness They Fear, and in 1998 Liv released her first solo album, Deus ex Machina. In 2003 she launched Leaves' Eyes with members of Atrocity, parting ways with Theatre Of Tragedy that same year. In 2004, she was nominated for a Grammy Award for her duet on Cradle Of Filth's 'Nymphetamine', one of many guest vocal appearances over the course of her career. Liv has sold upwards of 500,000 records with Theatre Of Tragedy, toured through more than 40 countries on five continents, and has charted consistently with Leaves' Eyes, Theatre Of Tragedy, and as a solo artist. She has done guest vocal appearances for acts such as Doro, Týr, Primal Fear, Atrocity, Delain and others and currently gearing up for the release of her 5th solo studio album. Kari Rueslåtten began her career at the age of 19 with The 3rd and the Mortal, recording the Sorrow EP in 1994 and one full length album with the band, Tears Laid In Earth, also in 1994 before deciding to leave. She recorded one album with Storm in 1995, Nordavind, before choosing in favour of a solo career that has since yielded five albums. Kari Rueslåtten was nominated to the Norwegian Grammy awards for her first solo-album, Spindelsinn, in 1997. Although Kari's time with The 3rd And The Mortal was short, she is best known and highly respected in metal circles for her performances. Nightwish keyboardist/founder Tuomas Holopainen has stated publicly numerous times that both Kari and Liv were huge inspirations in launching his band, and he appears as a guest musician on Kari's latest solo album, Time To Tell, released in 2014. Kari has previously worked with Martin Eden (known from his work with Björk, Nellee Hooper) and her music has been remixed by artists including Rawthang and Art of Fighters. She is due to make a guest appearance on the upcoming album from Norwegian rock legend Åge Aleksandersen.